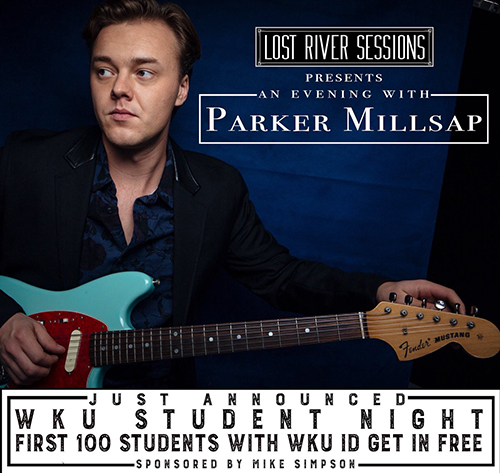 WKU Public Broadcasting and Lost River Sessions LIVE will present an Evening with Parker Millsap on March 16 at the Capitol Arts Center in Bowling Green. As a part of this special event, the first 100 WKU students who present an ID will receive free admission to the concert courtesy of LRS sponsor Mike Simpson. The free student tickets will be distributed beginning at 6 p.m. on the night of the show at the Capitol Arts Center. Auditorium doors will open at 6:30 p.m. with the music starting at 7 p.m. Millsap will play two sets with an intermission in between. The show will be recorded for later broadcast on WKU Public Radio. Regular tickets to the show ($10) can be purchased in advance at theskypac.com. Millsap, an Oklahoma native, released his latest album “Other Arrangements” in 2018. He has made appearances on Conan, Austin City Limits and Live From Here and also performed with Elton John at the Apple Music Festival in London. Lost River Sessions LIVE is a monthly live concert series produced by WKU Public Broadcasting and is made possible thanks to generous contributions from Mike Simpson, Farmers National Bank of Bowling Green and Scottsville, The Bowling Green Area Convention & Visitor’s Bureau, Glasgow EPB, Warren County Public Library and Katelyn & Zach Simpson. More information about Lost River Sessions can be found at lostriversessions.org.